← Are You One of ‘Them’?? I am woefully behind in chronicling our adventures here, but rest assured that the lack of posts does not mean a lack of adventure! 🙂 I’m going to start by rewinding back to our trip to Hannover and Hamburg. A good rule of thumb, for me, when catching up, is to start at the top and work my way down, and that’s exactly what starting in Hamburg is. The very top of the country (that I’ve been to, anyways)! This was our first entirely train-based adventure, and honestly, I was pretty proud of myself for getting that all set up. Now that I’ve done it, though, I can honestly say that it is extremely easy and really not that much to write home about. I fancy myself a little bit of a travel agent these days (no disrespect intended to people who actually do this professionally! ), and mastering the DB Bahn system was a small victory. We took the train from Aschaffenburg to Hannover on Friday night, and spent much of Saturday wandering around gardens and sculpture parks in Hannover. Saturday night, we took the train to Hamburg, where we stayed until Tuesday afternoon. 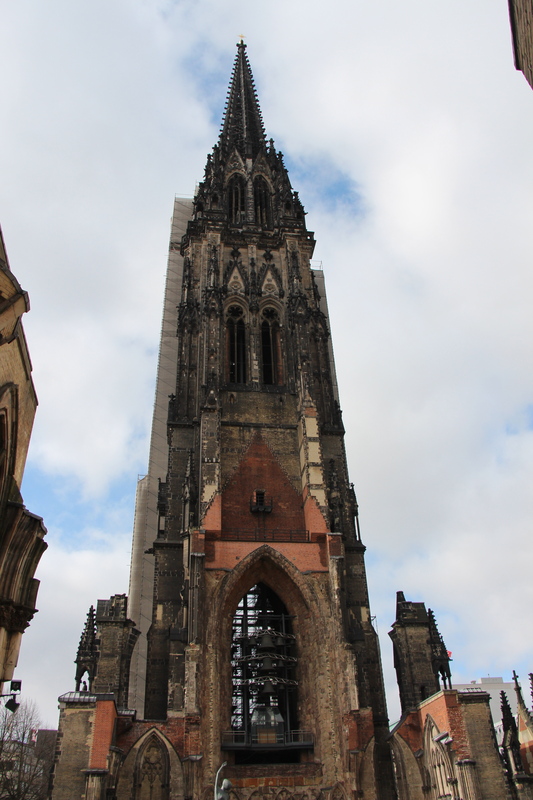 You’ve already seen most of the best pictures of Hannover here, so I’m going to focus mostly on Hamburg now. 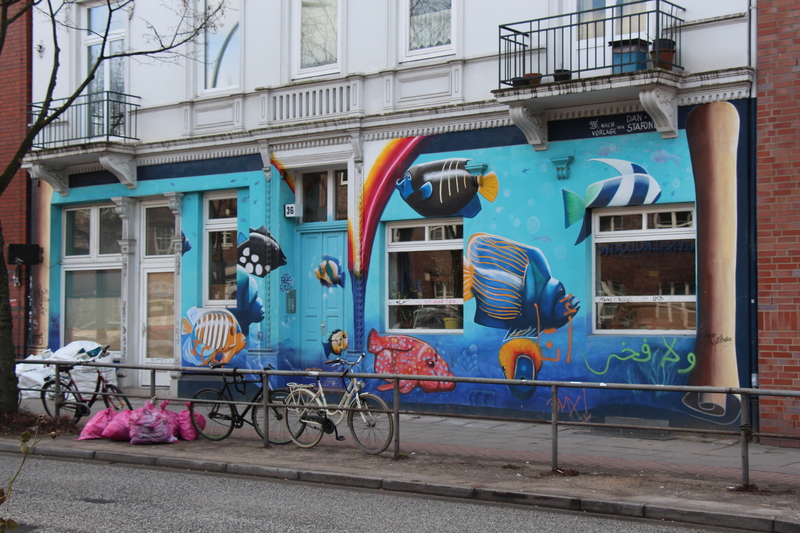 En route to the Mamalicious pancakery, which was in the Sternschanze area of Hamburg. 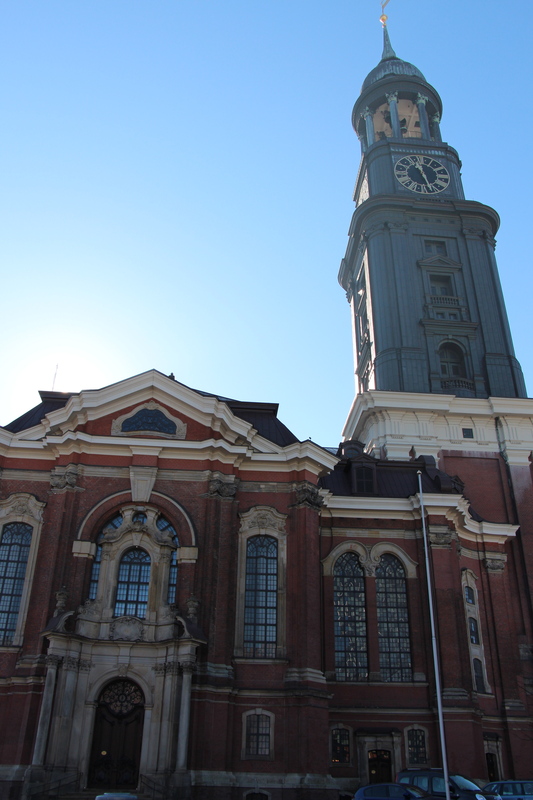 This area is part of the Altona district of Hamburg, which was ruled by the Danish until 1864, and was an independent city of it’s own until 1937. 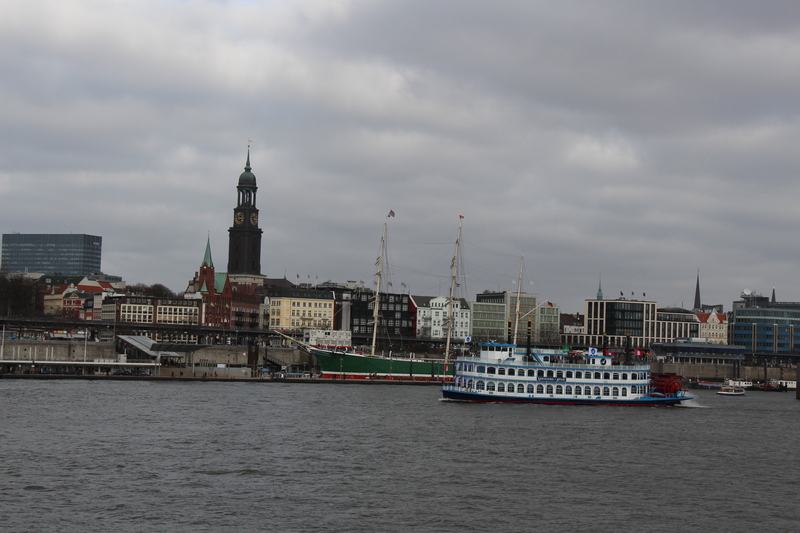 Hamburg is really lovely, and I wouldn’t hesitate to go back there. Not only was it warm – something the rest of Germany held out on me for until only within the last week or 10 days – but it was a fun, proud place where people dress for fashion, not for practicality! Fabulous! (I wonder if this is a weather-related thing, though, but I haven’t really studied it too carefully yet.. I’ll get back to you!) Did you know that there are more canals in Hamburg than there are in Amsterdam AND Venice combined? I had no idea… As Germany’s 2nd largest (by population) city, it is also a city-state. And a very pretty one at that (I’m always partial to waterfronts)! It is one of the most livable cities, too. Mike and I talked about how livable it seemed, and it was afterwards that I read that it is actually ranked as one of the top 10 most livable cities (2010) in the world. I think it also bears mentioning that Hamburg usually only gets snow a couple of times each year due to the influence of the ocean. I’ve gotta tell you that I will be perfectly ok if I never see another snowflake (unless I am planning on engaging in skiing or related activities, in which case I am perfectly happy to travel to the snow, rather than it being in my area). 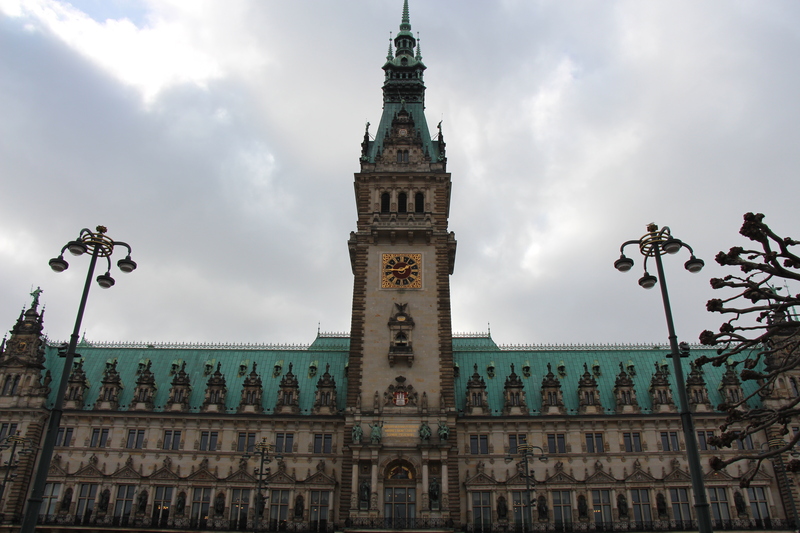 The Rathaus of Hamburg is truly magnificent. They also do a really nice tour where you can see the working offices of the government of the Free and Hanseatic City of Hamburg (that is the official name of the city, referring both to its place as an Imperial City in the Holy Roman Empire and its membership in the medieval Hanseatic league). 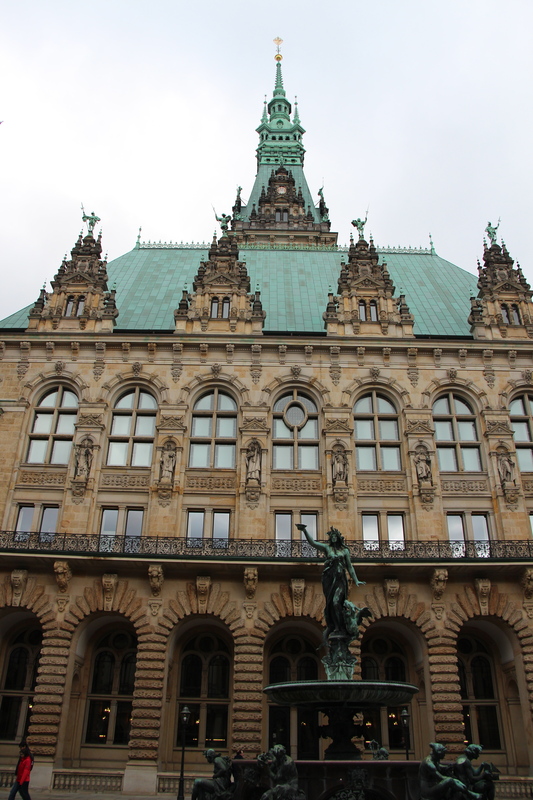 A different view of the Rathaus. St. Nickolai Memorial – a really moving monument to the horror of war. 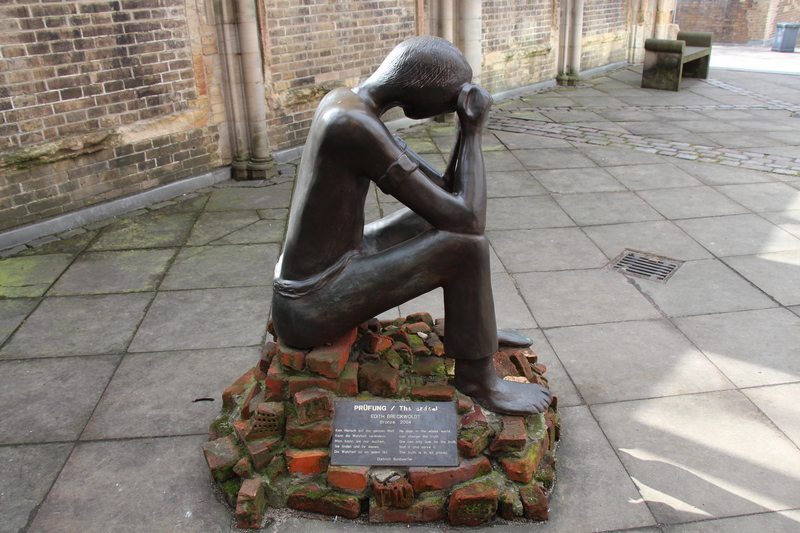 It is in a bombed-out church, and has several sculptures in the entrance that I found to be thought-provoking and haunting. One of the cool (and quite modern) buildings in HafenCIty, which is a fairly dynamic area of the city. 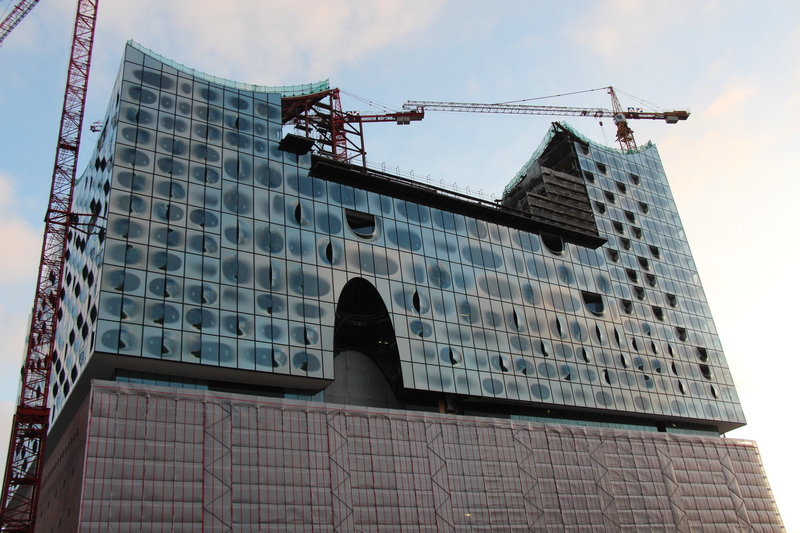 It will be their new symphony hall upon completion. From the Landungsbrücken (Harbor Promenade). Our main *excuse* to go to Hamburg was that we had tickets to see the Killers there on Monday night. We didn’t take any pictures, but you will have to trust me that it was a great show! We had such a great time… Hamburg in general treated us to a really wonderful trip, but the concert was significantly better than I was expecting. The crowd stayed pretty high-energy all night, and it seems like Killers’ fans in Germany like some of their later music a little more than their fans in the U.S. The experience at the concert reminded me of a cultural difference I’ve been meaning to comment on: queuing behaviors. In many, many respects, I have found the stereotype to be true in a good way – Germans do tend to be organized and structured. However… all of this seems to fall by the way side when it comes to standing in lines. At the grocery store, things stay fairly ordered and “normal.” However… at a concession stand, for instance, or even at a Kasse (checkout) at a department store, all bets are off. Every time the person who is conducting the transaction is finished, it feels like a mad dash to see who can get to the front next. Here’s a get-to-know-your-tour-guide tidbit to round out this post: one of my biggest pet peeves is people cutting in line (it is right up there with being interrupted and water on the bathroom floor). This has been a difficult adjustment. People cutting in line is one of the (VERY) few times that I’m really not conflict-averse and have been known to call people on it on multiple occasions. Fortunately (for me), I realized this was a cultural thing before I had the German language skills to tell someone to back off. (oh, can you imagine? I shudder…) In any case, buying some pizza called on my assertive-line-behavioral skills, but it also made me laugh. I’ve heard stories about throwing elbows at Legoland, so I know it isn’t just me being all sensitive to people breaking in front (fyi, I don’t just get annoyed when people break in front of me, it is strictly the violation of my assumed principles that is distressing to me; I have said something to people breaking in line in front of other people too, even when it didn’t impact me in the least). This entry was posted in Culture Adjustments, Traveling, Uncategorized and tagged DB Bahn, Germany, Hamburg, Killers, St. Nikolai. Bookmark the permalink. But the cold German Northern Winter is of legend this year, so I tip my hat (as a snow-driven Minnesotan) to you, Mike and Anne. Reading this… imagining if I were facing even the possibility of snow in May… I wonder how/why on earth everyone in Minnesota hasn’t moved to Germany. Or somewhere else… anywhere else! That is unbearable! I was feeling extra pitiful this weekend when a cold rain descended on these parts (highs in the 40s), but snow? In May? I could understand it if that caused some pretty significant psychic splitting. I’ve heard the opera in Mainz is pretty wonderful! I had the privilege to go to a dinner party with several members of the opera cast/crew in Darmstadt a few months back, and they had recently had several performances with the Mainz group. They had nothing but praise for their Mainz counterparts. I heard that the Frankfurt opera recently won a best of Europe award, too… Good times!